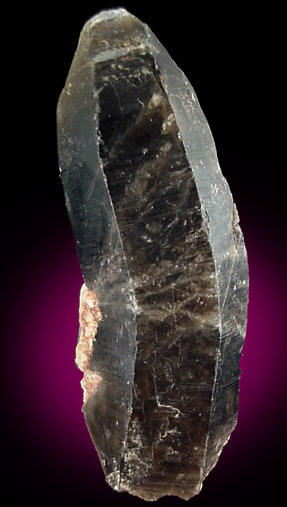 Dark crystal of smoky quartz with a distinct bend that resulted from deformation during growth. Though the rear faces are imperfect, the crystal is fully crystallized and doubly-terminated. Overall size of mineral specimen: 9x3.5x3 cm. Size of individual crystals: 9 cm.